Please note this is a 3 part class. 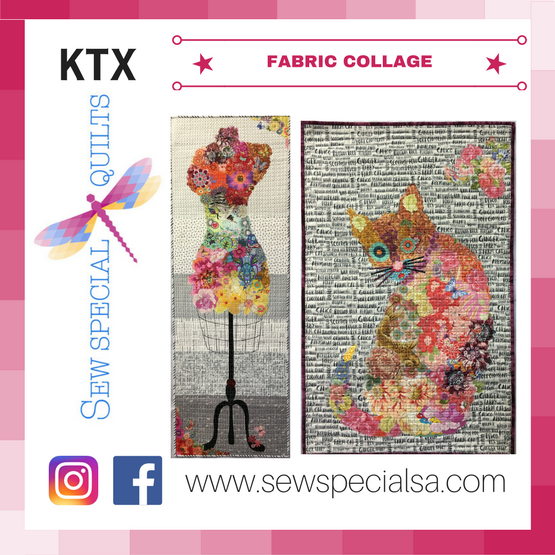 Purchase any Fabric Collage Quilt pattern by Laura Heine of Fiberworks from Sew Special Quilts for this class. The amount of fabric you need will depend on the pattern you choose, but 2 yards of assorted floral scraps, fat eights and/or fat quarters will be enough for the first class. Background Fabric(s): Will be discussed at first class. Pattern Ease or thin muslin: Will be discussed at first class. Steam a Seam 2: Start with 2 yards for first class. Floral Fabrics: A selection of scraps, fat eights or fat quarters in as many colors and scales you can find. Start with approx. 2 yards of assorted fabrics for the first class. You can always add to it as you go, if necessary. The amount of backing fabric, binding and batting needed to complete your quilt will depend on which pattern you choose. These requirements will be discussed during class. You will not need to bring a sewing machine to the first class. Bring your assorted floral fabrics, Steam a Seam 2 and sharp scissors. If you are unsure of what fabrics will work for this project, there will be time to shop for fabrics during the first class. Any Fabric Collage Quilt Pattern by Laura Heine of Fiberworks. Patterns available to purchase at Sew Special Quilts. See full supply list for additional requirements.